Miku is bringing Spring with her, surrounded by cherry blossoms! 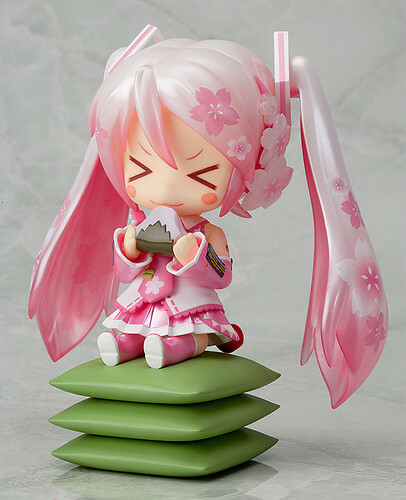 Nendoroid Miku is back again as ‘Sakura Miku’ , wearing an adorable pink outfit created with the image of cherry blossoms. The design is based on an illustration by Putidevil, which has been converted into Nendoroid form with careful attention to the meticulous use of color in the illustration! She comes with her standard expression, a crying face as well as an innocent expression munching on a rice cake. She also comes with an alternate head part which allows you to change the accessories in her hair into cherries to suit the season even more! Enjoy your Spring with Sakura Miku by your side! Mikatan also took the chance to preview this overly cute Nendoroid, showing the parts and accessories, as well as a few other scenes uncaptured by the official product photos. Visit Mikatan’s blog to view those pics and see some more tidbits regarding the Nendoroid. This product will be available at the GOOD SMILE ONLINE SHOP, priced at 3900 Yen. Order Dates: Orders can be placed between the 31th August 2012 (Fri) from 12:00JST until the 24th September 2012 (Mon) at 21:00JST. Estimated delivery will be in March 2013. This product can be ordered from the Good Smile & Karaoke no Tetsujin Cafe Akihabara store. Order Dates: Orders will be taken from the 31st August – 30th September 2012. Products will only be available in March 2013. This entry was posted in News and tagged hatsune miku, nendoroid, sakura miku, vocaloid.